What: Peta will be demonstrating how to make a Kokedama which is the Japanese art of growing plants in a moss-covered ball of soil wrapped with string. She made me a beautiful one as a thank you gift when I finished up at Concordia College. See a photo of my kokedama attached. What: Asher (former owner of Little Seed Restaurant) - My food ethos has always been about using the best quality produce sourced as local as possible and treated with respect. In 2016 it was this same ethos which eventually led to my wife and I changing our lifestyle and our restaurant to be completely plant-based vegan realising a plant-based lifestyle is both healing for the body, soul and the environment. ​Ethics and social consciousness is what drew me down this path but then I also quickly realised plant-based eating was not only more healthy but opened up a whole new world of creativity, flavour and excitement for cooking for me. I want to empower people by showing just how simple, fun and beneficial cooking plant-based can be. What: Neralie and Valda will be demonstrating how to make a couple of different types of fabric bags. They will show us a number of different ways to attach handles and how to decorate the bags using applique and reverse applique. They will also be providing the materials for you to practice doing the applique yourself. Please bring along a pair of sewing scissors and needles. If you don't have them don't worry, there will be plenty to share. Neralie and Valda will also be bringing along some of the beautiful bags they have made. Their work is very inspiring! Check out the attachment for more information and pictures. What: For our Christmas get-together we will have some mini-workshops which will look at ways we can upcycle things we have around the home for presents, wrapping, decorations etc. We will also have a Christmas Secret Santa where you can bring a present to the value of $5 that you have made, grown, baked or upcycled. Also if you would like to wear an item of clothing that you have upcycled, perhaps you attended our Slow Clothing workshop earlier in the year with Jane Milburn, we will have a mini fashion parade as well. All lots of fun but please don't feel like you have to wear upcycled clothes or be involved in the Secret Santa. Just come along for the fellowship and laughs. Also please bring a plate of morning tea to share. Requirements: Author, eco educator and organic horticulturist Linda Brennan from Ecobotanica, is our September guest presenter. You’re sure to go home from this workshop with a fresh approach to growing your flowers and using them in a delectable range of meals for you and your family. We’ll sample our way through a glorious garden selection of edible flowers that you can grow as companions to fruit trees, vegetables and herbs, and some that make the prettiest garden displays as well. Some of these blooms are savoury, while some are sweet and delicious, but all create that extra special impact in a dish as a feature flavour. Linda’s enthusiasm for edible flowers and using them on a daily basis is evident as she shares with you her recipes , home remedies and tips for making the most of these edible blooms from your garden. When it comes to growing edible flowers, you’ll go home armed with inspiration to make your garden an organic oasis that provides an abundance of pretty petals. Linda will demonstrate how to make Sunflower pesto from her beautiful award nominated, unique Australian book, gardening/cooking book ‘A Delicious Bunch, growing and cooking with edible flowers’. You’ll decorate gluten free Society Garlic Biscuits with an array of petals to increase the flavour and nutritional benefits as well. Linda will be making her book available to members for purchase on the day, at a discount price. It’s normally $39.95 in the stores. Linda will have it for sale for 1 book for $35 or 3 books for $90 by cash or card. You will also be able to purchase seeds of edible flowers, all grown organically, from Linda’s own garden, at $3 per pack. Requirements: Strips of fabric approximately 3cm wide. The strips can be torn or cut. A great source of material is sheets and doona covers from the second hand shop. It is hard to give an exact amount required but approx 8 metres x 1.2 metres or about 2 single sheets worth. Just bring a selection of different fabric that you want to use for your rug to start with on the day. You can always cut more later. There will be some strips available on the day if you are unsure of how to cut the fabric or you run out. You may also wish to just start by making a hot pot stand which will mean you need a lot less fabric but you learn the basic skills. Rag Rug Tool. 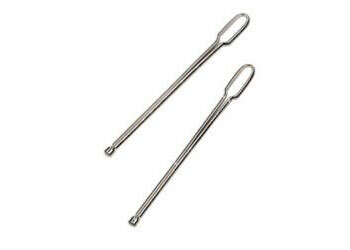 The tool I used to make my rug was an elastic threader (see picture below) which you can get from Spotlight or Lincraft. A large safety pin used for nappies would also be suitable. Bookings Required: RSVP 22 August. Where: Range Christian Fellowship, 15 Blake Street, Wilsonton. What: Patricia will be demonstrating how to make feta and mozzarella cheese and will also talk about how to make camembert. Patricia has requested that people wear a hat, scarf, hairnet or tie back your hair to avoid hair in the cheese as you observe the process close up. There will be some cheese tasting as well. What: If you love sewing but find it too expensive to buy new fabric or you are interested in finding out what you can do to recycle old clothes, sheets, doona covers etc, this is the workshop for you. In this workshop we will show you examples of what you can do with recycled fabric such as quilts, dresses, bags, rugs and jewelry. We would love you to bring your own examples to share with others as I am sure many of you do this already. There will also be a hands-on component to the workshop where we will be teaching you how to make t-shirt yarn and then turn it into a simple necklace. So you will need to bring along a normal old t-shirt (the bigger the better), needle, matching thread and a pair of scissors. Using the t-shirt yarn we will also teach you some basic macramé knots that can be incorporated into lots of different projects. What: Many people already know about the dangers of chemical fertilisers, insecticides, fungicides and pesticides in standard produce. Organic farming is becoming increasingly popular as people seek out safe and healing foods BUT, nutrition farming takes organic farming to another level, where we're not just looking at avoiding chemicals, but focusing on replenishing and balancing the soil to create produce as nutritious as it was designed to be.Birdsong Market Garden is one of the new generation of small farms, remineralising their soil and focusing on nutrition. Come along and tour the farm with farmers Rick and Racheal Cameron and see how it works. Racheal will be providing morning tea so please RSVP to simplelivingtoowoomba@gmail.com by 25th April so she knows how many to cater for. What:Racheal will be showing us how she makes soap using the room temperature method. Then Suanne from Green Dandelion will demonstrate how to make beeswax wraps and will bring along her bottles of beeswax, resin and coconut oil mixture to sell as well as brushes, applicators and fabric for those who want to buy the complete kit. We have had requests for both workshops as they have both been very popular ones in the past. Racheal did a beeswax wrap workshop last year but some people were disappointed that they missed it so we are fortunate that Suanne now has everything you need to get started with making your own. Also Racheal will have her wonderful homemade soap for sale too. Margaret will show 4 different ways to tie furoshiki, a type of traditional Japanese cloth used for wrapping or carrying and she will also display her collection of furoshiki. Racheal will show you how to blend quality salt with various herbs, spices and ingredients like vanilla. A very simple and versatile homemade gift option...especially for those who love to cook or are hard to buy for. I will show you a simple way to gift wrap your presents. Racheal will have some delicious vegetables from her market garden. Margaret will be selling some crocheted dishcloths and facewashers. Shiralee will be selling what she calls 'stocking stuffer' gifts. Felt book marks, felt brooches, felt angel ornaments, a couple of tea towels, hand painted greeting cards and painted ornaments. All at super low prices for present bargain hunters! As it is our last event for the year instead of our normal swap we are going to have a Secret Santa. If you would like to be involved please bring a small, wrapped, handmade or homegrown gift up to the value of $5 and we will have some fun exchanging gifts. Also please bring along a small plate of food to share for morning tea. Sourdough Workshop - Back by popular demand. Chris did a sourdough workshop for us in November last year. What: Chris will be bringing several stages of the sourdough along to demonstrate how to feed, knead and bake the sourdough. Last workshop Chris baked a straight white, high-top loaf and a savoury peasant loaf which was like a pull apart - with cheese, cherry tomatoes and fresh herbs. It was delicious! Chris will have some sourdough starter for people to take home so if you are interested bring along a clean jar. Depending on numbers as I think this will be a popular workshop there may not be enough for everybody. We will be having our handmade and homegrown swap before the workshop. If you would like to be involved bring up to five items that you have either made or grown. All items need to be on the table by 9.45am. ​Bookings Required: RSVP 18 October. Following the amazing ABC TV series "War on Waste" (http://www.abc.net.au/ourfocus/waronwaste/) where presenter, Craig Reucassel, set out to uncover how much waste we as a nation produce and what we can do to reduce this amount our next Simple Living workshop will be on this timely topic. Australia is ranked 5th highest for generating the most municipal waste in the world and our waste is growing at double the rate of our population. Personally after watching the series my husband and I were so convicted that we have made quite a few changes to our home and how we shop. The focus for this workshop is to give you lots of ideas to help you reduce your household waste. What: This workshop will be full of ideas on how to reduce your waste. In the first half of the workshop we will have heaps of tips, tricks and products to help you reduce your plastic and disposable product use. Racheal will be demonstrating how easy it is to make beeswax wraps which can be used instead of Clingwrap. This part of the workshop is really a forum where we are hoping that lots of people bring their hints on how to reduce waste. With plastic free July wrapping up you may have lots of ideas on what 'disposable' products can be replaced with reusable/washable ones. What: Basic cold-process soapmaking is easier than you think! Just 4 ingredients (which you can find at the supermarket), about 1/2 hour of your time and some basic kitchen equipment is all that's required to make you own soap at home. You then have huge flexibility to be creative and add in all sorts of herbs, spices, clays, fragrances and the like to personalise your soaps. 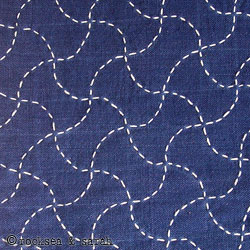 What: Margaret will be doing a hands-on workshop where participants will be making a mug mat which is a large coaster incorporating the traditional Sashiko embroidery method - see below for an example of Sashiko embroidery (not the actual pattern we will be using). Margaret will be supplying all the materials needed for the workshop including material, needles, thread and wadding. What to bring: Ruler and 2B pencil. Do we just need to declutter our homes or are there other things we could declutter ie calendar, email, work place etc. Time: 2pm - 1-2 hours. The demo is about an hour, and then questions etc are welcome at the end. Cost: $10 which includes a recipe sheet and a little kit with ingredients to make a recipe or two at home for yourself! Where: 118 Boundary St, Cranley. ​What: Lip balm, face and body wash, hair moisturiser, oil cleansing, bath salts, tooth powder, insect repellent and more can be made simply and safely at home with inexpensive non toxic ingredients. Come along if you'd like to find out how. We may even have time to make a few other products also! Where: Toowoomba Showgrounds - Homestead Building clearly signed with Toowoomba Spinners and Weavers. What: Marilyn from the Toowoomba Spinners and Weavers will be conducting a felting workshop from 9.30-11.00am where the participants will be making a flower out of fine wool using the wet felting technique which could be used as a decoration on a hat or corsage. Afterwards there will an opportunity to speak to other members in the group and to watch them doing some spinning and weaving. Needle and threads - grey or pale blue. Bookings Required: 15 March. Places are limited to 15 people. What: Making jam is a great way to preserve food and use fruit when you can buy it cheaply or have an abundance of your own produce. Glenys is a master jam maker. She makes jam out of everything and anything. She has just recently made mango and ginger jam. Doesn't that sound good! For this demonstration Glenys will be taking you through the steps of jam making, giving you lots of tips and tricks and many suggestions for jam combinations. She will also be giving you a small bottle of jam to take home on the day. What: Chris will be bringing several stages of the sourdough along to demonstrate how to feed, knead and bake the sourdough. She will bake a straight white, high-top loaf and a savoury peasant loaf which is more like a pull apart - with cheese, cherry tomatoes and fresh herbs. Sounds delicious! Chris will have some sourdough starter for people to take home so if you are interested bring along a clean jar. Depending on numbers as I think this will be a popular workshop there may not be enough for everybody. Bookings Required: RSVP 16 November. What: Racheal will be talking about different grades of oils and how they can be used for therapy, cleaning and beauty products. Racheal will be giving each person who attends a 1ml sample bottle, with an info sheet on how to use it, with some of the most versatile oils, like lemon, clove, tea tree etc. That way you can try it out for yourself at home in some recipes. We will be having our handmade and homegrown swap before the workshop. If you would like to be involved bring up to five items. All items need to be on the table by 9.45am. What: Mary and Murray, a delightful couple who have been herbalists for many years will be talking about how to grow herbs, what herbs to grow in Toowoomba and how to use them. With extensive knowledge of herbal medicine they will also demonstrate how to make an ointment and a tincture. Oakey Library (also known as Jondaryn Shire Library) are hosting a FREE cold process soapmaking workshop at 10am on Thursday 1st September. Spaces are limited and bookings are essential. I believe the class is limited to about 12 people, so if you've already participated in a soapmaking workshop, spaces for this one are probably best left to people who haven't ever had the opportunity to attend before. What: Mead (honey wine) is the most ancient wine known to man. If you would like to learn another way to use your honey, we will explore some of the basics of how to hand craft Mead and some of the Mead types (Cysers, Melomels, Methoglins etc). We will also learn about some basics of making Cider (with apples) and Perry (with pears) at home too. I know I have skipped June and will let you know soon what is happening then but I wanted to let you all know about our fermentation workshop in July as I know it will be popular and will book out quickly. Elspeth Haswell-Smith from Food For Life has agreed to do the workshop for us. 2 jars, minimum 1lt capacity. Vegetables and herbs! Please be creative however if you would like a recipe to follow bring some beetroot, carrot and ginger. Or some cabbage and apples, carrot and turmeric, fresh beans and broccoli, cauliflower and curry powder.... email me if you have concerns. Fruit - apples, ginger, fresh dates, fresh figs, dried figs/dates, whichever fruit you have a available. Parking - There is a large carpark behind the cafe on Grange St, Toowoomba. This is the designated cafe parking. There is a walkway to the cafe from the carpark. What: Tunisian crochet, also known as Afghan crochet, creates a look that is a combination of both knitting and crochet. For tunisian crochet you will need an elongated crochet hook that has a smooth barrel - like a cross between a crochet hook and knitting needle. I use a double ended crochet hook but looking online some people use one with a stopper on the end like a knitting needle. They need to be about 8-10mm wide. My husband has made six of them which are available for $5 each. If you would like to purchase one please let me know so I can put one aside. You will also need some 8 ply wool. What: Racheal's husband, Rick, will be showing us how to make sausages. I am so excited about this workshop. I have been wanting to do this for ages. As well as showing us how to make them we may even be lucky enough to get a taste! What: Mr Neville Hunt from the Beekeepers Association has very kindly invited us to come to his place to see how to keep bees. He will show us the equipment required and outline the processes involved. There will be no swap on this day. What: Learning to make your own cleaning products is easy and very cost effective. Racheal will be showing us how to make washing soda and liquid soap (bases for other recipes), laundry powder, glass cleaner, softscrub (for ceramic surfaces, sinks and benches), mold and mildew remover, gunk/label remover, furniture polish (for timber), oven cleaner and multipurpose spray. We will be having our handmade and homegrown swap before the workshop. If you would like to be involved be bring up to five items. All items need to be on the table by 9.45am. What: This free event will be a mixture of workshops, demonstrations and displays of a whole variety of different ideas for Christmas decorations and wrapping ideas. If anyone would like to do a mini workshop or bring along some homemade Christmas decorations for display please let me know. Also bring along a small plate of food to share for morning tea. What: An informal morning with everybody bringing their own craft that they are working on, sitting around the table and having a chat about what simple living means to us. There will be limited numbers so if you are interested please RSVP as soon as possible. There will be no charge for the morning but please bring a plate of morning tea to share. What: Learn all about keeping your own chooks including breeds that you can buy, feed and chicken coops. If you would like to ask Victor, our presenter, any specific questions please direct them to Michele (nannachel@gmail.com) and she will pass the questions on. What: Janelle will take you through some basic information about gluten, coeliac disease, and label reading; have a chat about ingredients, foods to avoid, and how to cook gluten free and dairy free on a budget; as well as give tips that will help children and adults live gluten free. She will also demonstrate how to cook with some of her favourite gluten free and dairy free ingredients, including quinoa and polenta. What: A horticulturist from Bunnings will be coming to give a presentation about organic gardening. If you have any particular questions that you would like answered please send them to Michele on nannachel@gmail.com. Michele will collate them and pass them on. What: At the workshop we will be demonstrating a variety of homemade health and beauty products such as vapour rub, sunscreen, lip balm, solid perfume, facial cleanser and shaving cream. Where: Good Shepherd Lutheran Church, 23 Glenvale Road. This free event will be a mixture of workshops, demonstrations and displays of a whole variety of different ideas that you can make for Christmas gifts. RSVP by 12 Nov.
Mandy will be running a hands-on workshop making soy candles. So please bring a tea cup or vase to make your candle. You can also have a go at stamping spoons to make something like a plant marker. You will need a dessert spoon preferably silver as they are easier to stamp, although a little more difficult to find. If you can flatten the spoon with a hammer before you come that will make it quicker to complete the project. Also we will have a display with items such as a calico angel, decorated candles, junk journals, mini albums and handmade wrapping paper from brown paper bags. Tonya from The Crafty Mummy is also going to bring some of her Christmas decorations to put on display. If anyone else would like to do a mini workshop, demonstration or display a gift idea please let me know. The more the merrier! As it is our last event for the year instead of our normal swap we are going to have a Secret Santa. If you would like to be involved please bring a small, wrapped, handmade gift up to the value of $5 and we will have some fun exchanging out gifts. Margaret is going to show us how to make a basic loaf - Mix, knead, rise, punchdown, rise, cook, eat which can all be done in 2 hours. I can smell that bread cooking now! We will also have a swap table. We will start at 9.30am and combine our swap with a cuppa. So if you would like you can bring along up to five handmade or homegrown items. Lynda will be taking us through the steps of fermenting vegetables and Racheal will show us how to make some fermented drinks. We will once again have a swap table. We will start at 9.30am and combine our swap with a cuppa. So if you would like you can bring along up to five handmade or homegrown items. What to bring: 4mm crochet hook, 4ply cotton. No bookings required. Just come along. Joshua Philips will be giving a demonstration on pasta making and showing us how to make a couple of sauces to go with the pasta. As a young man Joshua is a terrific role model for other young people so it would be great if we could really encourage other young people to come and see how to make pasta. We are also going to combine the workshop with a homegrown and handmade swap. The swap and cuppa will start at 9.30am. The swap and cuppa are free and don't require bookings! Just bring along up to five items that you have grown or made for the swap table. You are welcome to come to both the workshop and cuppa/swap or just one of them. Bookings Required by 21 May. Ron Phillips will demonstrate how to make haloumi, paneer and ricotta cheese. Make a necklace and bracelet out of buttons. Great Christmas present idea. what you cook! These workshops are for those wanting to learn how to cook or to get new ideas. Share your stories, ask advice, bring along a plate of homecooked goodies for morning tea and join in a handmade and homegrown swap. Bring along any craft project that you are working on and a plate of supper to share. Share your stories, ask advice, bring along a plate of homecooked goodies for morning tea and join in a handmade and homegrown swap. For the swap bring along up to five things that you have made by hand or grown at home eg. jars of pickles, bunches of herbs, pincushions or potholders. in July learn how to make Soup and Freezer Fillers such as garlic bread and fried rice. August will be Sweet Treats. Plus you get to take home what you cook! All ingredients and equipment will be supplied. If anybody is interested in an evening workshop please let us know as we will add more workshops if there is enough interest. These workshops are for those wanting to learn how to cook or to get new ideas. “The Principles of Organic Growing”, “Healthy Soil” and “Organic Pest and Disease Control” will be the topics covered in this hands-on workshop. Participants will be making sprays etc and an open discussion will be held on each topic. Make a booking on the Contact and Booking Form. No bookings required. Finnish Sima (lemon drink) and pulla (cinnamon rolls) demonstration included! This month learn how to make Freezer Fillers such as garlic bread and fried rice. Plus you get to take home what you cook! All ingredients and equipment will be supplied. If anybody is interested in an evening workshop please let us know as we will add more workshops if there is enough interest. These workshops are for those wanting to learn how to cook or to get new ideas. Learn the basics of how to reupholster chairs. This is a hands-on workshop and you will be putting the skills you learn into practise. All equipment and materials supplied. No bookings required. Basil pesto demonstration included! This month learn how to make a Curry Base which can be use to make curried sausages, prawns, vegetables, pasta, mince, chops and tofu and Potato Bake 2 Ways. Plus you get to take home what you cook! All ingredients and equipment will be supplied. If anybody is interested in an evening workshop please let us know as we will add more workshops if there is enough interest. Discover how to make a basic mozzarella cheese in the microwave. Learn to make a sour dough starter and view examples of the different steps in the process. Sample a finished sour dough loaf and try the fresh mozzarella with it. Delicious! No bookings required. Lemon Butter making demonstration included! This month learn how to make Potato-Topped Pie and Apple Crumble Cake. Plus you get to take home what you cook! If anybody is interested in attending a Cooking from Scratch Workshop in the evening during the week please let us know as we will add more workshops if there is enough interest. All ingredients and equipment will be supplied for the workshop. Everybody would love to save money on their grocery bill. Come along and learn some great techniques including menu planning, online grocery shopping, stockpiling and many more. Also share your ideas on how you save money. For a printable version of the program please download the program here - Simple Living Toowoomba April Program. No bookings required. Baking scones and butter churning demonstration included! 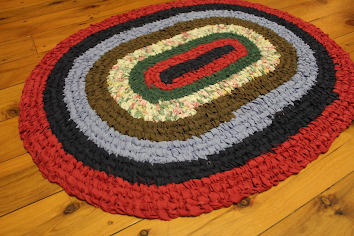 Rag Rug Workshop Back by popular demand! 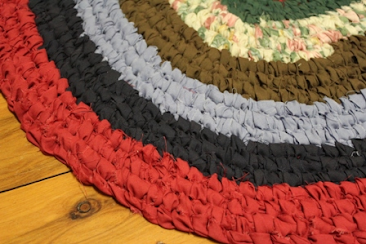 This rag rug, also known as a toothbrush rug requires no sewing to complete. Requirements: Strips of fabric approximately 3cm wide. The strips can be torn or cut and it is best to do it with the grain (parallel to the selvedge) rather than across the grain as there is less fraying but it really isn't a problem either way. A great source of material is sheets and doona covers from the second hand shop. It is hard to give an exact amount required but approx 8 metres x 1.2 metres or about 2 single sheets worth. Just bring a selection of different fabric that you want to use for your rug to start with on the day. You can always cut more later. There will be some strips available on the day if you are unsure of how to cut the fabric or you run out. Requirements: Please bring along a 1L container so that you can take some homemade laundry liquid home. You will also get to take home a piece of soap to try out! Date: Thursday 7 & 14 March Note date change! Requirements: Size 4 Crochet Hook, a ball of 8 ply wool. Where: Kelly’s Place – 745 Murphy’s Creek Road. This will be a hands-on workshop where we will be actually creating a compost heap, looking at a compost heap that is too dry or too wet and learning how to fix it and creating a no-dig garden. As well we will get a tour of Kelly's wonderful place, full of examples of sustainable gardening.